iTelMobile decided to release the guide on how to verify or check if any iTel Android Phone you are using or the battery is original or fake. This was mapped out in order to see that their customers are not mislead on their products. This is not the first when you talk of phone manufacturering companies releasing such guide. Tecno manufacturing company did same in the past few years and now iTel is out for it. The purpose of this, is to see that purchasing fake mobile phone in the market is reduced. So its a welcomed development isn't it? There is no ambiguity in the process involve in checking this, but everything is made so simple and easy for all to use. So are you already using or intend to buy iTel Android device then, you are advised to apply this in other not to regret later. 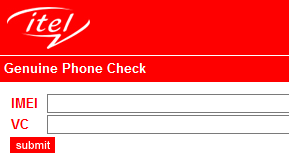 Very easy as said earlier, as you can see anyone using or going for iTel device can easily check if the phone and the battery is fake or original. Thanks to iTel manufacturing company for the new development which I think can go along way in protecting customers from buying fake products. So you are safe!!! Always share to let others know about this development. let's protect our selves from scammers by doing the right thing.